To download this product, you'll need Garmin Express. We've mapped every hill and valley for your next great adventure. 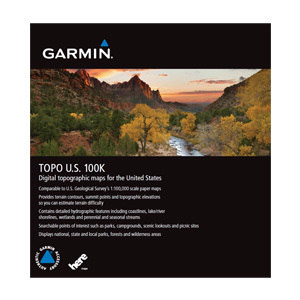 Now with more detail than ever, this product covers the finer points of the outdoors with topographic maps comparable to 1:100,000 scale USGS maps. It also includes terrain contours, topo elevations, summits, parks, coastlines, rivers, lakes and geographical points. Provides detailed digital topographic maps, comparable to 1:100,000 scale USGS maps. Includes updated road content, by HERE (non-routable). Contains detailed hydrographic features, including coastlines, lake/river shorelines, wetlands and perennial and seasonal streams. Includes searchable points of interests, such as parks, campgrounds, scenic lookouts and picnic sites. Provides elevation profile on compatible devices so you can estimate terrain difficulty. Contains roads, trails and highways in metropolitan and rural areas, so getting to your destination is easy when you create point-to-point routes on compatible devices. Displays national, state and local parks, forests, and wilderness areas. The file size of this download and space required on device or microSD™/SD™ card is 600 MB. If this download does not fit on your device, data may be saved on a microSD/SD card (Recycled microSD cards may be used to program map data). NAVTEQ Maps is a trademark of NAVTEQ. ©2016 NAVTEQ. All rights reserved. Includes topographic coverage throughout Kentucky, West Virginia, Maryland, Virginia, Tennessee, Florida, Georgia, Alabama, Mississippi, Louisiana, North Carolina, South Carolina and Puerto Rico.